Uchûjin Tôkyô ni Arawaru (1956) - Sci-fi-central.com. Japan  1956  87m   Directed by: Kôji Shima.  Starring: Keizô Kawasaki, Toyomi Karita, Bin Yagisawa, Shôzô Nanbu, Bontarô Miake, Mieko Nagai, Kiyoko Hirai, Isao Yamagata, Gai Harada, Yûzô Hayakawa, Kanji Kawahara, Sachiko Meguro, Toshiyuki Obara.  Music by: Seitarô Ômori. UFOs are seen around Tokyo. Because they look like giant starfish the aliens cannot approach us without creating panic. Hence one of them sacrifices itself and takes the form of a popular female singer. It/she warns mankind that a meteor will crash on Earth. While the approaching meteor causes hotter and hotter weather, mankind runs and builds a last-chance anti-meteor weapon. Memorable for most of the very wrong reasons coming from 50's Sci-Fi... but not all of them, because it somehow turned out not as hopelessly inept as I thought it would be. But first off, the alien effects should probably receive an award for "Silliest Monster Design Ever". The aliens are supposed to be giant starfish creatures, but they just look like an actor wrapped around in bed sheets with their arms and legs spread and then the designer just knitted it all together. And they come with a glowing eye-ball (or something) in the middle. And man, you should see them walk, with their legs spread and all... Unbelievable. And you get to see all this in the first 5 minutes of the movie already. So, yeah, you immediately start thinking "Okay, it's gonna be that kind of picture...". However, WARNING FROM SPACE indeed might be a goof-fest the size of Tokyo, inexplicably it does turn into a better movie progressively.Though never as good to redeem itself completely. Not by a long shot even. Now the first scene on earth, has an astrologist looking though a telescope at some... white dot in space. Then characters get introduced, all this inter-cut with shots from more astrologists looking through telescopes at strange white dots in outer-space. Then things start really happening. The starfish aliens invade Japan, terrifying the population, causing panic, it's all in the news and papers and after 30 minutes into the movie those scientists are still looking through their telescope at white dots in space without having a clue what's going on outside? First rate chuckles provided. The two main things that make it painfully inept are (aside from the starfish aliens), the dialogue (and how the actors bring that to the screen) and the plot that just can't decide where it wants to go. Strangely, that last aspect is also one of the assets that keeps the movie going, because the focus on the plot just keeps on changing: First there's alien starfish invading Japan, causing terror and fright amongst the people. Then we learn that they are after a scientist's formula, which supposedly is a weapon of mass destruction in development. So the alien starfish are here to heed mankind from our own mistakes, thus preventing the annihilation of our race. They transform a starfish into a human female, modeled after Japans most famous cabaret singer. So there's two of them running around. One's the real one, the other one's an alien, has no fingerprints, jumps about as high as a building during tennis and walks through closed doors and walls. Eventually, she just rips the formula out of the scientists notebook, basically says that it's a bad invention and just disappears through a wall again. And just when it seems the movie is about to end, we learn that a rogue planet "R" is on a collision course with planet earth. Then a group of gangsters (for lack of a better word) is out to steal the scientists formula. I'm guessing by then, Planet "R" is getting mighty close, because giant floods are washing away the city. Then the alien starfishes come up with the plan to use the formula to save the world: Just shoot the weapon in a rocket towards Planet "R" and blow it up. Great! I was shook up all over the place like a milkshake while trying to follow that plot. But it was a fun ride. Scientist (looking at his watch): "Hmm... Is it really so late?" That one guy: "For dinner yes, but for supper we're still early. Hahaha!" That one guy + Scientist: "Hahaha... Hahahaha... Haha!" I was like "Okay, what's with the laughing? It wasn't that good of a joke." Also imagine every actor speaking English with a Japanese accent, because they have to, since this is a Japanese movie. You just can't take this movie serious on any level, really. And yet they try so hard to be serious. And what's with the Japanese always asking for a Geiger-counter the second they see something strange. There's some slime at the shipping docks discovered, they go: "Geiger counter!". There's a weird light shining on the wall, the scientist goes "Geiger counter!". Spilled some soup? "Geiger counter!" Now I did say the movie gets better, right? Well, what I meant was: it becomes more watchable. There's an occasional crane-shot to be admired. Charming miniatures are being used when the city floods. Some buildings collapse. 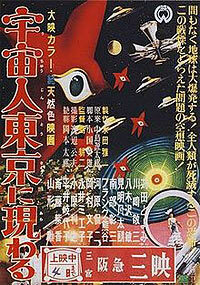 And not to forget that spectacular morphing scene when a starfish alien transforms into that Japanese female singer. But the silly acting and plot stupidity remains. The ending is marvelous. Planet "R" goes "Booom! ", and bunny rabbits crawl out of their holes, turtles go for a swim, birds are singing and children run into their parents arms. And then... they just glued on that morphing scene again, but played it backwards (making it look like the female turns into a starfish again)..
Review by Vomitron_G from the Internet Movie Database.